He remarks that this is intended to be a kite that can be built on a budget. I will build it as such... with less expensive fabric and frame. For the speed of building, I will have less detail than my B'zar thread, but may reference it and other websites for some clarification. If this is your first build and you are following along, please make full use of the resources on this site... see the sticky threads at the top of this portion of the forum. This kite would be a good choice for a first build if you are patient and have some experience sewing. Tom's Le Quartz (popular first build) is slightly easier... but I have faith that with some reading and a small amount of practice, the P2 can be a successful first kite that anyone can be proud of. Here are pics of the plans. I recommend printing the at full size. PM me if you need to hear the logic behind this, or check out the beginning portions of the B'zar build thread. For this build I will be using some less expensive ripstop polyester that I acquired a few years ago... not my usual choice, but an ok substitute for the higher price coated ripstop (icarex pc31) that I usually use. If you have pc31, use it. My purpose is to use up some fabric and provide a less expensive solution for first time builders (or those on a budget). The fabric I'm using has a different pattern (rectangles rather than squares) to the bias, and I'll show some pictures later comparing fabrics. Note that the picture above has been altered slightly from the colorizer on the P2 website to reflect the exact seam pattern. I would recommend using the website colorizer for best color results. Coming next will be a list of materials I have chosen to use for the build. I fully recommend the list of materials that are on Kareloh's website. The beauty of this kite, as he states is that you can feel pretty confident that the kite will be good even with a variation in frame material. I'm using parts that are readily available here in the states. I would probably go with the recommended frame if it is available to you. That being said, here is a list of parts/material I'm choosing for the build. 1. ripstop polyester (not pc31). The fabric I'm using may not be available anymore, but I'd try hang-em-high when they get back up and going (which will be soon I hope) from their holiday. 2. .230 pultruded carbon (as discussed in the P2 introduction thread, this will be the closest to the exel cruise that is recommended by Kareloh's). 3. various APA connectors, (leading edge, center T and spine) to be pictured later. 6. 3mm solid carbon for standoffs. For the carbon, it is my intension to use one piece leading edges. If you need to have a leading edge that breaks down, you'll need some ferrules that will fit .230 (external aluminum ferrules are available in this size). Yes you are nuts for starting a second project without finishing the first! So, although I look forward to the completion of the B'zar 2011, I solute you in this effort as well. I look forward to what you will be bringing to the table on this one. I will confess; I have finished the B'zar that is the subject of the other thread. I'm just behind on the documentation. 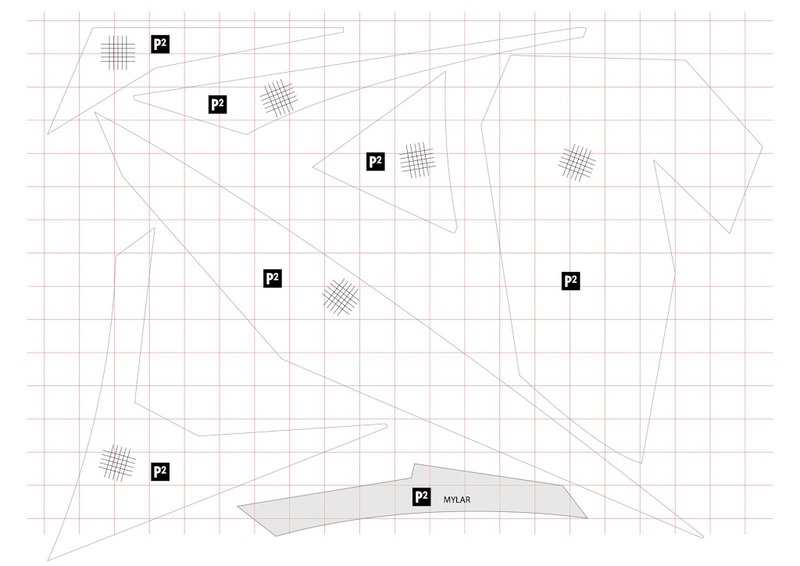 For reference, here is a panel layout diagram with each panel labeled. I'll refer to this on a regular basis during the sail build. Ah yes the never ending saga known as paperwork. I'm beginning to think the experts are right when they say the amount of paperwork we do has quadrupled with the advent of computers. Added a link to this thread on the p2 website. Looking forward to see the results. no time to post proper additions to the thread today... perhaps later this week. What I wanted to add is that I have made up my mind to build a second one of these kites concurrently with the first. 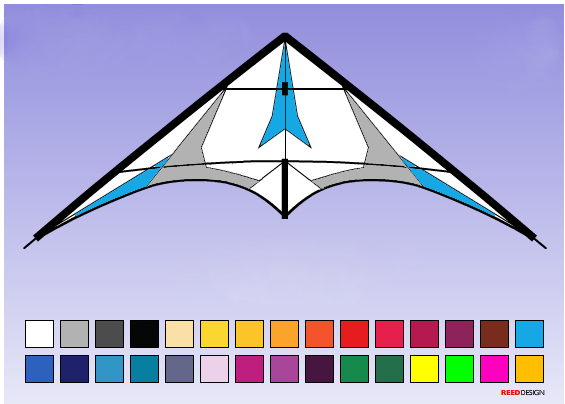 As the first one is designed to be a budget kite, I'll be doing the second using my usual higher end materials. 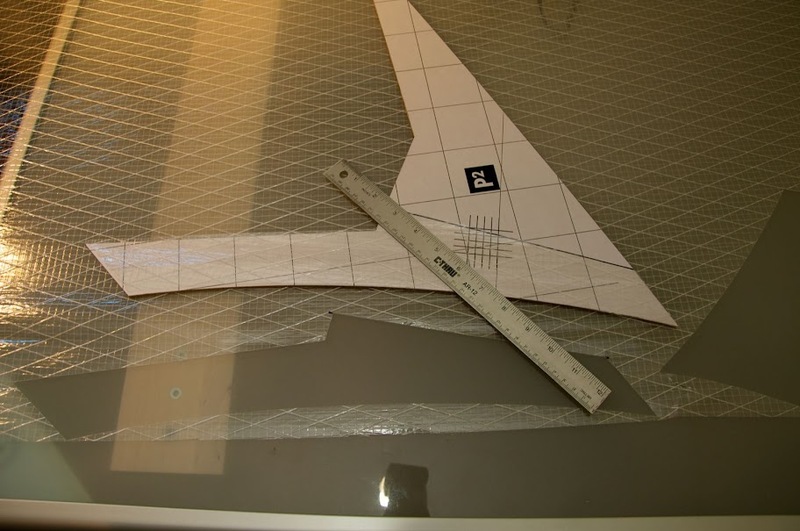 Skyshark frame will be used, pc31 fabric, mylar coated leading edge, and slightly different construction technique. I will document all of the differences. I've already cut out the panels for the first version. Pictures to be posted later this week with comparisons of fabric and frame materials on the two different kites. Great! this version looks very nice indeed. Still prefer the original layout though (with the 'fangs'). color adjustment... icarex build will include some gray. call me a conformist, but I like the suggestions and examples posted. As you can see, it's not an exact replica of the previous examples. 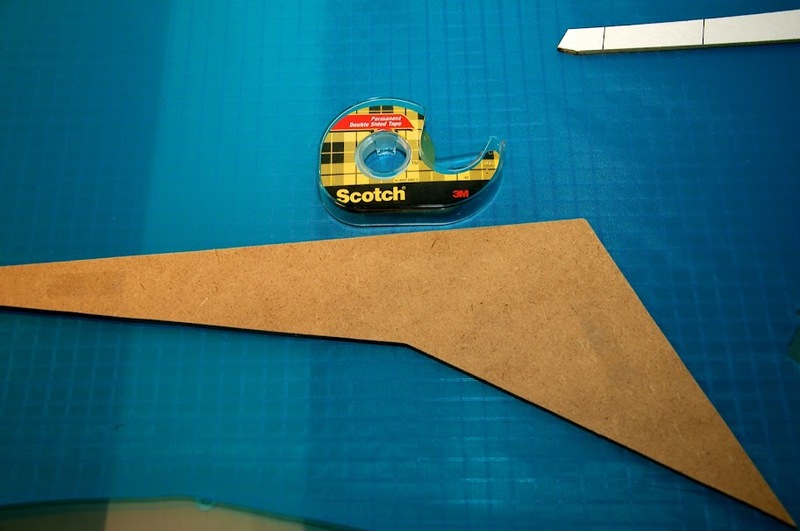 I have finished cutting out the panels and have started to glue up the sails. I'll post some discussion regarding differences between the cheaper polyester ripstop and the PC31 fabrics (with pictures) and I'll give a few insights that I find helpful. Stay tuned, more coming soon. so, I've made templates and cut out all of my fabric for both kites. (for template construction, see B'zar 2011 build thread). The first fabric I'm using is less expensive polyester ripstop. It is not coated like PC31, and the bias is shaped differently. This is the same material used on the original Silver Fox 2.3. See the difference in bias here; PC31 is square (blue piece laid on top in picture). This other material (Texlon .6 oz polyester, limited supply left in the world) has rectangular bias. In terms of bias orientation, I line it up so that the long length of each rectangle is perpendicular to the leading edge or trailing edge (as the templates/pattern shows). Because of the rectangular bias, it's a little harder to make the best use of space out of a sheet of fabric. 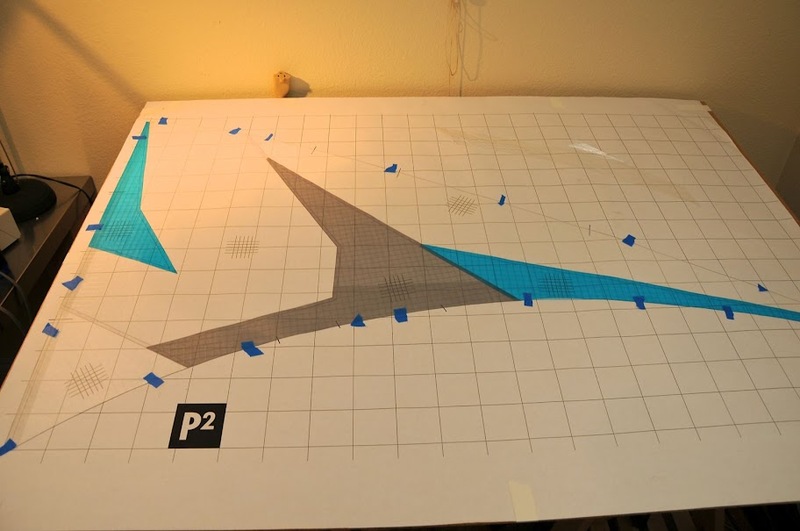 When cutting out the PC31 fabric, it is symmetrical and square, so you can line the templates up to use the available fabric area more effectively. 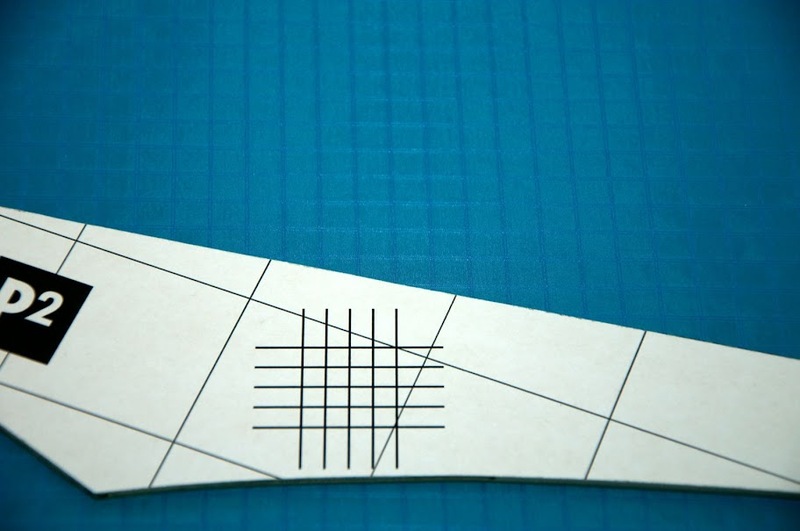 Regardless of what fabric you use, make sure you pay attention to the bias and how it lines up with the templates. 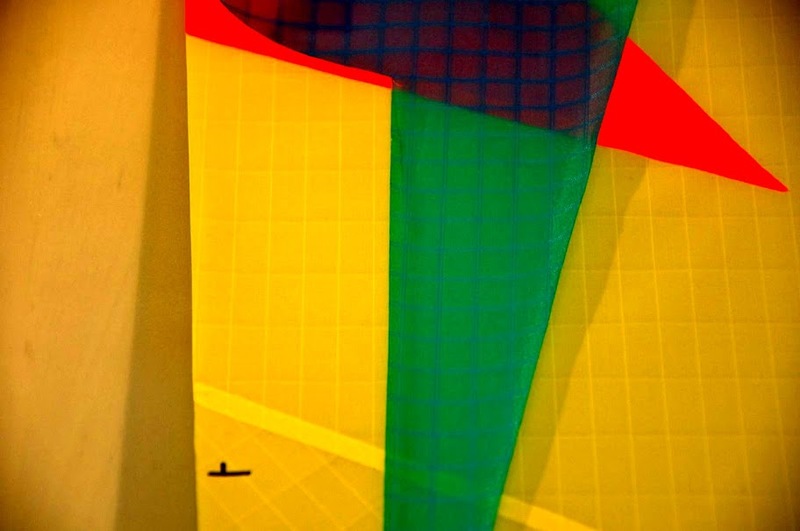 This will ensure symmetry in how the kite looks, and symmetry in how the fabric stretches on each side of the kite. 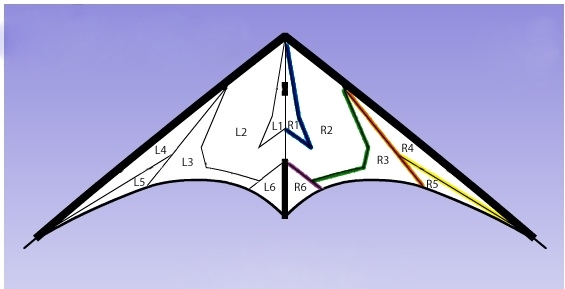 If the halves aren't a mirror image of each other, you risk one side stretching differently than the other and this could affect how the kite performs later on. Something I failed to mention in the B'zar thread is this; I put a few pieces of double sided tape on the bottom of the templates prior to cutting. This keeps the template from moving on the fabric while I'm hot cutting. This prevents errors. For the mylar back panel/reinforcement, rather than cut out an entire new template for this panel, I drew a line on the larger panel that it lays against. 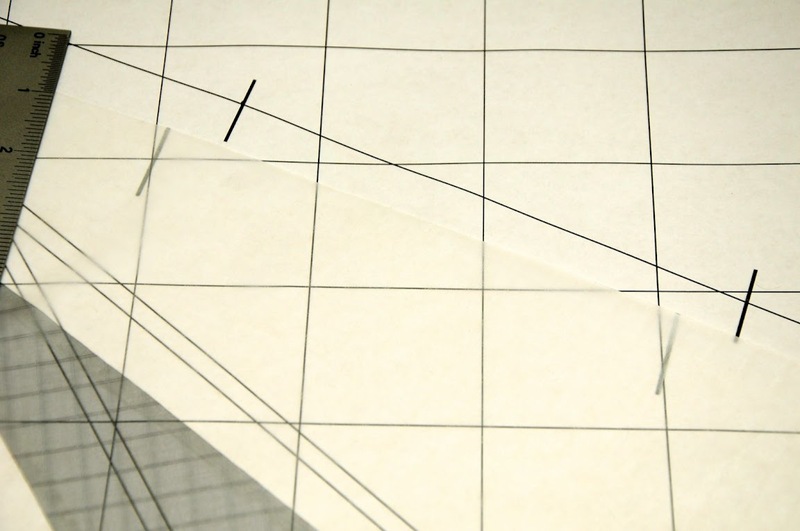 Then, I put the large panel on the mylar, and cut around it up to the point where the line is. Marking the mylar with a sharpie, I remove the template and cut the remainder of the mylar piece using a straight edge. This saves me template material and the time it would take to make an additional template. Here is a picture of the right half of the PC31 sail. 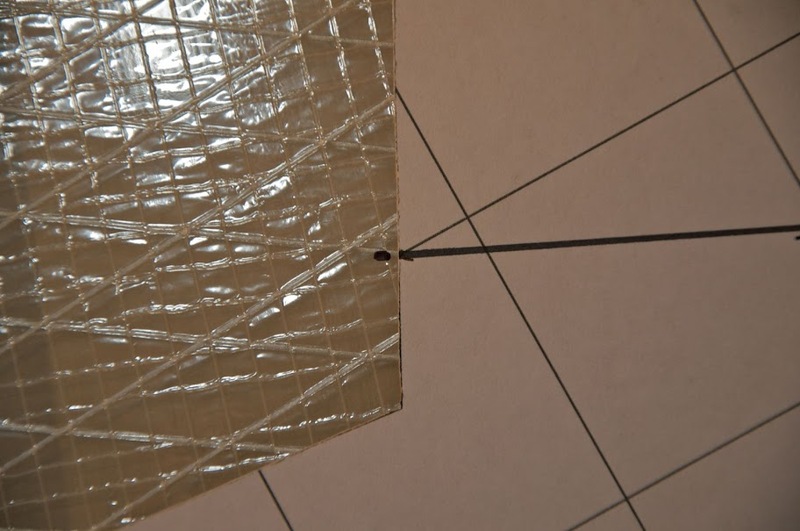 I tape the sail down before I glue (using a simple glue stick... I like the purple ones that dry clear and colorless). I tape it down to make sure I get all of the over laps correct. when facing the front of the kite, darker colors should be in front of lighter colors at the seams. 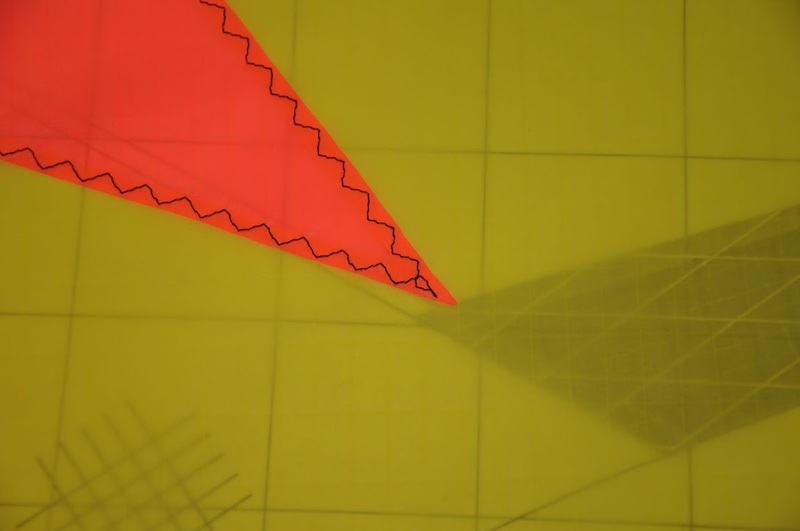 this will prevent colors from visually bleeding through when the kite is backlit. 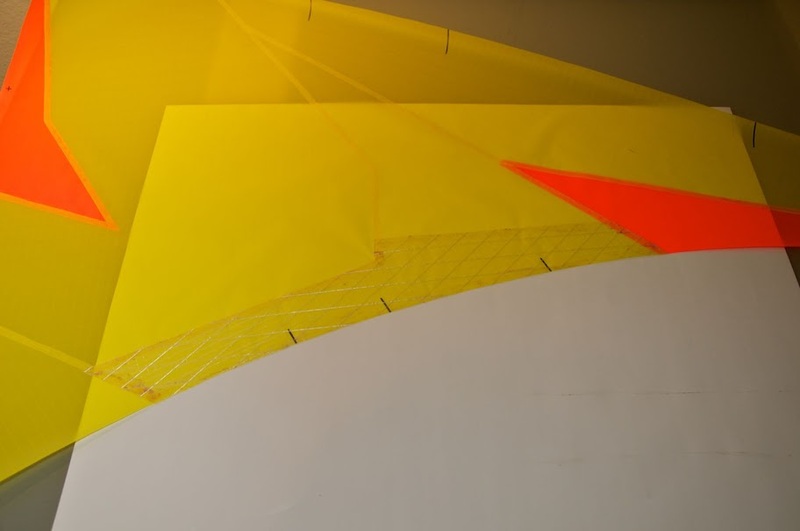 Remember that when you glue (or tape) up the left side of the kite, the front of the kite is actually down, so the panels should be glued in the opposite manor... with dark colors on the bottom. Refer to the first half to ensure symmetry, especially when overlapping panels of the same color. Next post will discuss sewing and my preferences for stitch size and style. 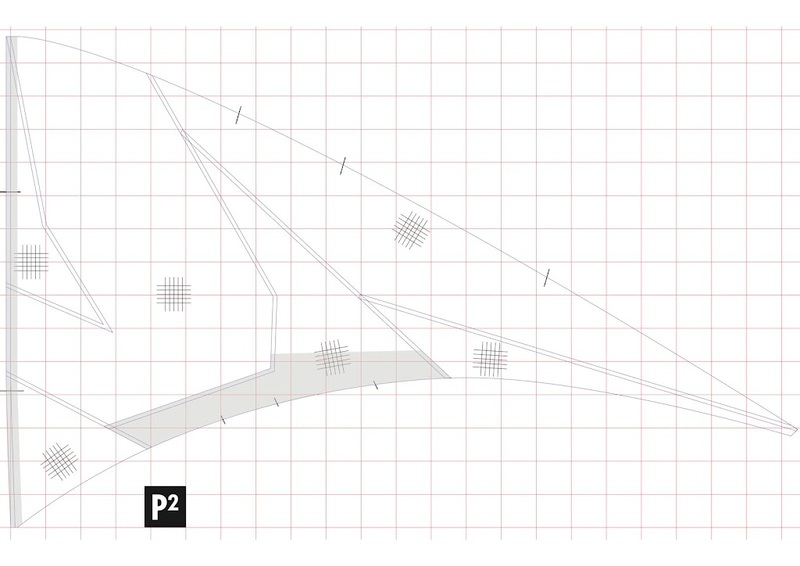 It should be mentioned that the seam overlap on the P2 is smaller than other kite plans in the public domain. This will require a little more attention to detail and be harder to hide sloppy sewing. Just be ready to take your time. Beware of black fabric; Having light colors that you can see through will make it easier to see the seam overlaps when sewing. With black, you have to follow only one edge of the seam when sewing, rather than visually stitching down the center. If this is you first build, sew some test strips so you know visually where the seam is when sewing. Compare the front and back of the sail to be sure you don't sew outside of the seam (this won't destroy your build if it's not too bad, but it will be a visual flaw that you will always see when you look at the kite). Anyway, here's some visual bliss to entertain you until the next post. This is a panoramic view from Mt. Rose (south west of Reno). That is Lake Tahoe on the left. At full resolution, photo can be printed as large as 8 ft wide and have enough detail to make out individual trees. Perhaps I'll do a tutorial on panoramic photography in another portion of the forum at some point in the future. The red and yellow fabric looks like Ventex. I really liked my Over which was also a Ventex version. This fabric sounds very different in flight compared to pc31. Muffled could be the richt expression. Really curious how it will perform. My guess is will be great in higher windspeeds. I actually did contact Texlon (fabric manufacturer of this lightweight polyester) and they have told me that they no longer produce this .6 oz polyester ripstop. That being said, I know of one source that still has two colors available... yellow and pink. PM me if you're interested. Moving on. I didn't spend much time in the B'zar thread discussing the order in which seam should be sewn (I may have mentioned it briefly). Here is a diagram in the order I recommend... especially for first time builds, and I will explain. Here is a diagram with the seams highlighted in color. Remember that you'll be sewing one half at a time. By going in this order, you always sew over the top of the previous seam ending and you save the hardest seam for last (continuous seam with several sharp turn). Remember to sew with your needle stopping in the down position so that when you lift the foot to turn the corner, the needle keeps the fabric in the proper orientation. When arriving at corners, sew one stitch at a time, left the foot and turn the fabric... if the continuation of the seam lines up with the foot the way you want, commit to the turn and continue sewing. if it isn't lined up properly, turn the fabric back to the previous orientation and stitch a little further (then try the corner again). This will give you the best possible stitch around the corners. Due to the nature of the sail design/visual pattern being angles and straight lines, I've opted to use a 3 step zig-zag rather than my typical choice of a serpentine stitch. For the narrower seams on the P2, I've set my machine at a width of 4 and a length of 2. 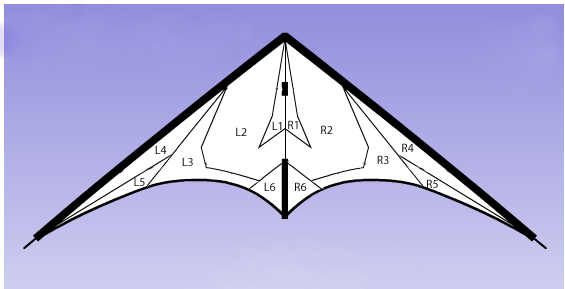 This doesn't leave much room for error, so if you're building this kite as your first, maybe go for a width of 3.5 in order to hide any inconsistencies you may have in your sewing. When sewing, something to strive for is even corners. In some instances, I change the stitching pattern to make the corners beautiful. I've messed this up; on my icarex sail, after making one of the corners, I selected the wrong stitch pattern on my sewing machine and the result is about 2 inches of the seam that has a different pattern (this is extremely frustrating, but will not be a problem for performance. It just won't hold up to my normal expectations). I don't achieve this all the time, but if I figure out how in the future, it will be what I strive for. 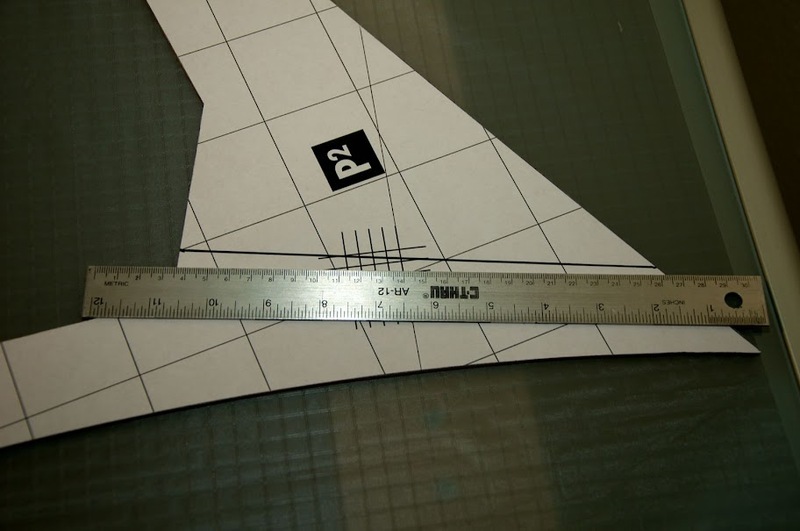 Something I failed to mention earlier in this thread (although it was covered in the B'zar thread) is that I like to mark all of my leading edge and trailing edge attachment points while the sail is taped to the plan. I use a straight edge and mark with a sharpie at the point where each connector will attach to the kite. Be sure to make the mark long enough that you'll see approx 1/8 of an inch after you sew on the trailing and leading edges. I love my metallic sharpies for this job, as they don't make such a dark mark that they immediately stand out on the finished kite. Sequoia panoramic from my recent weekend in Yosemite.